There is no doubting that center Jay Guillermo is strong. But he has an even stronger family who has been the backbone of his life. One family member in particular shaped him in innumerable ways. 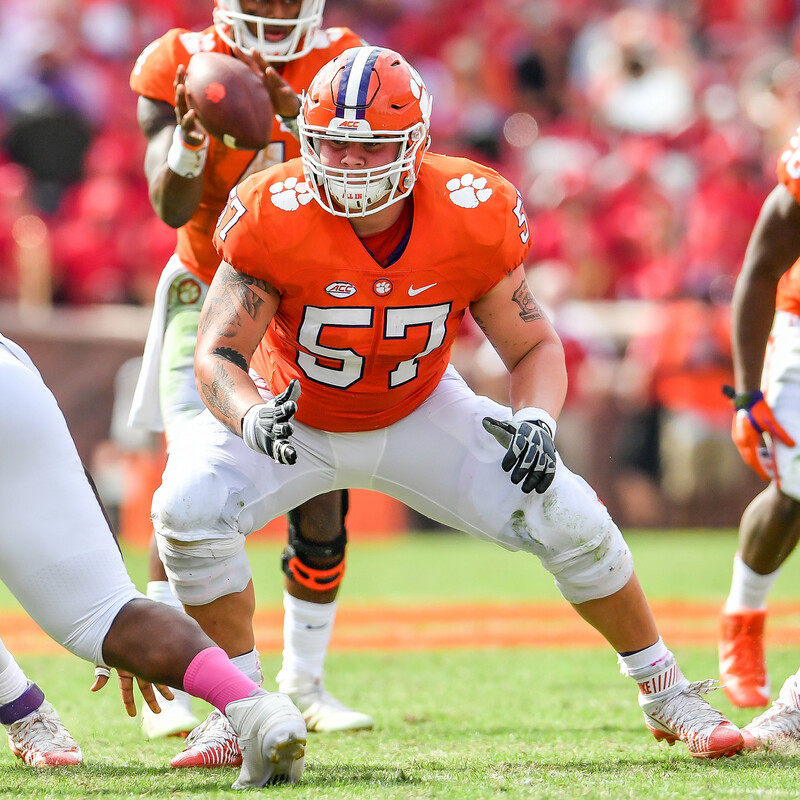 Guillermo’s grandfather was the head coach at Burns High School in Lawndale, N.C., for much of the offensive lineman’s life, giving him an interest in football from a young age. After spending time breaking down film with his grandfather, Guillermo decided to suit up for little league football. “My first year was in the second grade, and I remember the first day we put on pads…all of the coaches wanted to do the Oklahoma drill (full-pads blocking drill in a confined area). And proud he made them when he decided to commit to the first college that offered him, Clemson. But Guillermo’s love affair with the Tigers started much earlier than the day the first recruiting letter arrived in the mail. “I had been a Clemson fan my entire life…it was always my dream school. My grandfather had always liked Clemson, because when he was in college, he was recruited by Frank Howard. Once he arrived on campus, Guillermo made sure to seize every opportunity he was given, especially when it came to running down the Hill. There to pick him up if he did was All-American Dalton Freeman. Guillermo uses what he learned from Freeman when he works with the Tiger offensive line. However, there was a time in his career when Guillermo was not seeing things as clearly as he does today. In February 2015, he left school to deal with a mental illness that had been creeping its way into his life…depression. “It was one of the darkest times of my life,” he admitted. “I called up my mom and said I wasn’t sure if I wanted to play football anymore. After working hard for months to get control of his depression, Guillermo came back to school, and football, for summer camp in 2015. He began splitting snaps with Ryan Norton until Norton suffered a serious injury. Week after week, Guillermo dedicated countless hours to keep his level of play the best it could possibly be. He applied the strength and determination he had from fighting his mental illness to the gridiron. “My success is a testament to all the hard work I did while I was gone. It made me feel that my struggle was all worth it. Football aside, Guillermo is most proud of one accomplishment…graduating with a degree from Clemson next month. But before he crosses the stage to receive his diploma, Guillermo is planning to live the rest of his time as a student to the fullest. His passion for that same grind is something that Guillermo hopes to leave behind for his teammates. “I want to be known as a hard worker…a person who wasn’t afraid of work and gave everything he had every day. When the senior runs down the Hill alone against Pittsburgh on Senior Day, he knows that he will be filled with a plethora of emotions. “I am probably going to be nervous about falling again,” said Guillermo laughing. When his final day in Tigertown does come and Death Valley is in his rearview mirror, Guillermo had a simple answer for what he is going to miss the most about this place. “Everything. Luckily, when you come to Clemson, you are a part of the family and you are welcome back any time.